Paper Seedlings: BOO TO YOU! 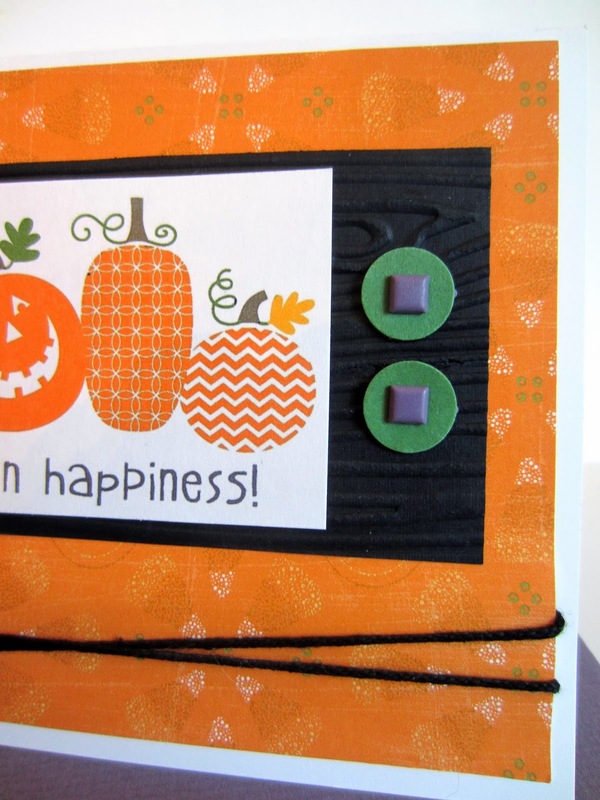 I just have a few Halloween-flavored projects to share with you -- BOO TO YOU! I made some of these cute pumpkin pails for my Stamp-In Club members. Buckets from the Target Dollar Spot, they came with chipboard tags in the shape of a coffin. I was about to throw the tags away, when -- WAIT! They are shaped like COFFINS! I had wanted to make tags to hang on the buckets anyway. So, I sanded the glossy surfaces of the tags a bit to give them some tooth. I then covered one side of each tag with Anywhere Glue Stick, and adhered a piece of Sahara Sand cardstock. After smoothing the paper in place really well, I trimmed off around the shape. I then stamped it with an old Stampin' Up! Trick or Treat stamp. So far, so cute, eh? I then applied Anywhere Glue Stick to the flip sides of the tags, and this time adhered some retired Stampin' Up! Halloween DSP, trimming around the edges once again. I then took my sanding block and sanded the edges to bond the paper to the tags. After filling Stampin' Up! cellophane treat bags with an assortment of seasonal treats, I placed the closed bags inside the buckets along with some purple crinkly basket filler, and tied the tags onto the handles. 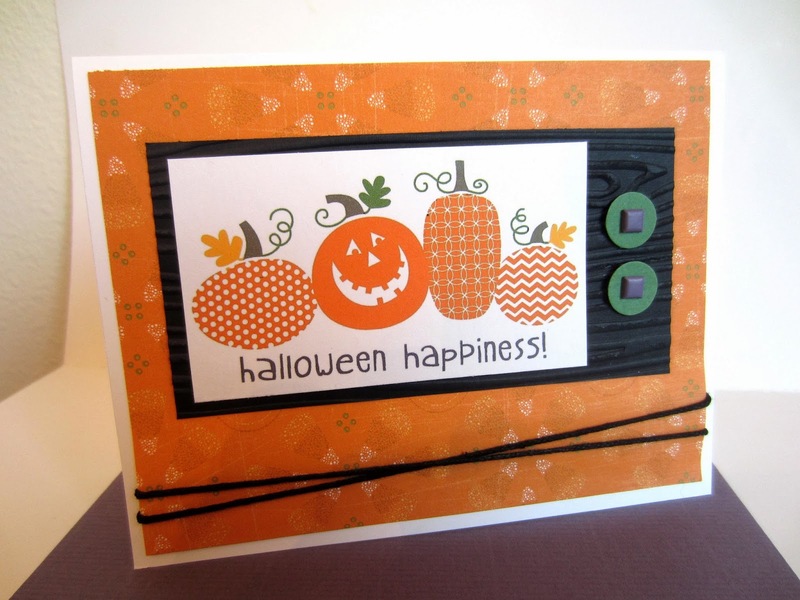 On this Halloween greeting, once again a hybrid card, the image was created in MDS and printed out, then cut to size. 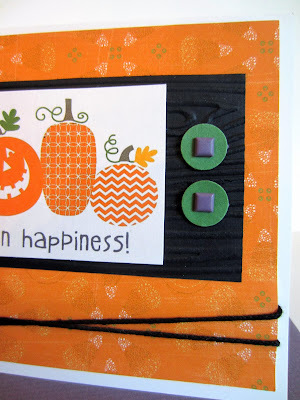 The black cardstock on which I mounted the pumpkins was run through the Big Shot inside the Woodgrain Embossing Folder to give it a little more of an eerier feel. I punched out green circles with the 1/2" Circle Punch, inserting some old square purple brads in the center of each and applying to the embossed background with Glue Dots. Some thick black crochet cotton wound a few times around the subtle candy corn DSP, then adhered to the Whisper White card base finished it off. I hope your Halloween is just as spooky as you want it to be! They are both really cute! 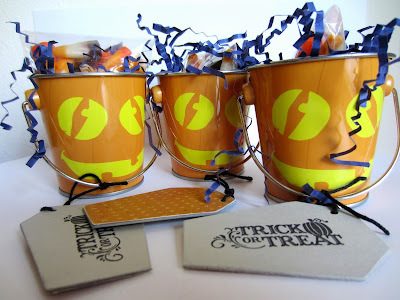 I love the little pails, I actually have some leftover orange pails from the Target dollar section that I might make into something for Thanksgiving. Thanks for sharing on the weekend re-Treat link party. Thank you for participating in the project Handmade Cafe!